Coventry City have completed the signings of defender Aaron Martin and striker Frank Nouble. 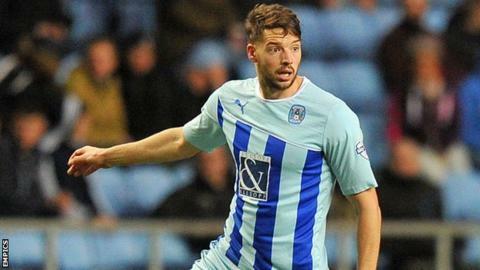 Martin, 25, who returned to the Sky Blues for a second spell on loan in October, has signed an 18-month deal following his release by Yeovil Town. Nouble, 23, initially signed on loan in September, has now penned a deal until the end of the season following the termination of his contract by Ipswich. Subject to Football League approval, he has been brought in on a free transfer. After starting his career at Chelsea, Lewisham-born Nouble rejected the offer of a professional deal to sign for West Ham United in 2009. The England Under-19 international spent three years at Upton Park, being loaned to West Bromwich Albion, Swindon Town, Swansea City, Barnsley (twice), Charlton Athletic and Gillingham before joining Wolves in June 2012. Mick McCarthy signed him for Ipswich Town, for whom he has made the majority of his 149 career appearances to date. He moved on to Coventry in the summer window, since when he has netted four times in 17 appearances. "We believe he's shown the potential to develop into a Coventry City player," said City boss Steven Pressley. "This is a pivotal period in Frank's career. The deal is only until the end of the season. He must show the supporters and myself during this period that he is worthy of a longer-term deal." Martin first came on loan to Coventry in February 2013, when he was under contract at Birmingham City. "We tried to bring Aaron to the club two years ago," added Pressley. "He is a player I have tracked ever since. And his presence at the back has helped contribute to our recent impressive defensive record. "He is a terrific professional with a real desire to improve and we believe that we can give him the confidence and platform to do so."